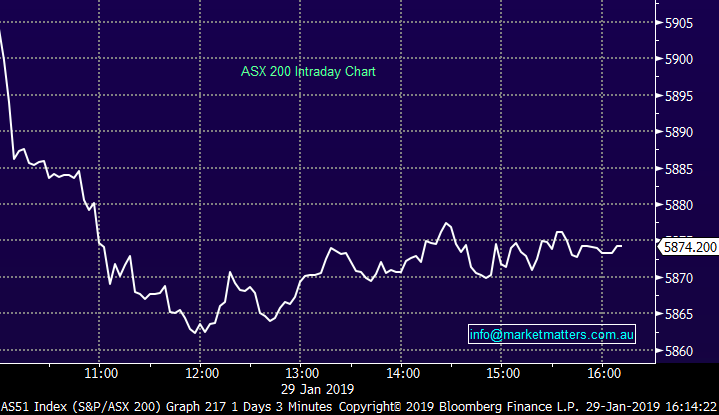 The ASX 200 came off the boil today with the index now looking set for a more protracted pullback into the ~5750 region or ~4% lower. After a reasonable open considering the weakness overseas, selling towards the banks ticked up and the market grinded down into a lunchtime low. Business conditions were weak in December according to the NAB survey - the results showing the steepest monthly fall since the GFC with retail being the worst-performing industry. The declines were "broad-based" and across every state and industry according to NAB with Retail remaining the weakest link. While that was a clear negative there was divergent performances across the bourse today with Telstra (ASX: TLS) rallying more than 7.77% to top the leader board of the ASX 200 – pretty rare event in recent times + its highest close since early October on more than 5x the usual daily volume after TPG said they’ll walk away from the planned 5G roll out – more on that below, while Resmed (ASX:RMD) fell another ~10% after some harsh broker downgrades this morning, the stock closing today at $12.96 down from $16.45 towards the end of last week. Broker Moves; Macquarie have gone more defensive across their Australian Equity Strategy increasing exposures to more defensive style yield investments (REIT’s & Infrastructure) while they’ve cut mining to underweight. They increased weightings towards CBA, WBC, ANZ, GMG, RHC, AZJ & ORG while they added positions in QBE, GPT, MGR, TAH, LNK, COL, TCL & ALX. On the flipside, they cut JHG, IFL (ouch! ), URM, LLC, OML, QAN, DOW, BLD, WOR, AWC, MIN and reduces WES, ALL, OSH, BHP & RIO. Resmed (ASX:RMD) $12.96 / -10.44%; was sold off aggressively again today taking its 2 day decline to around 20% following a weak earnings result and some downbeat commentary from management. We stepped up and bought RMD today, allocating 3% of the MM Portfolio around $13.00. A couple of things to think about; RMD has fallen 20% in 2 days on the back of a miss to earnings and a muted outlook. The miss to earnings (and outlook) were a fraction of what the share price implies however we’ve obviously seen a big PE re-rate down for a stock that was incredibly well owned. 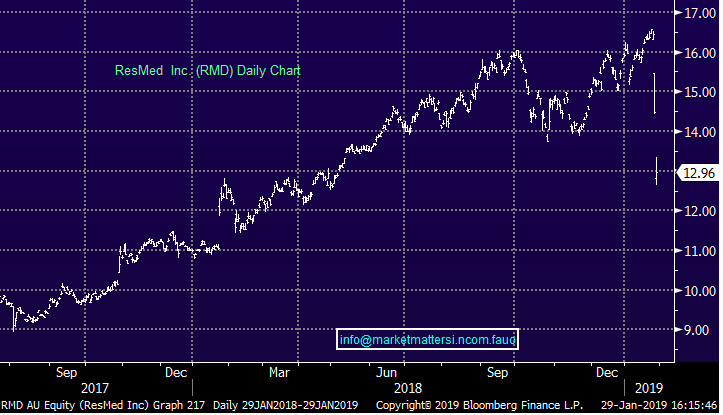 RMD is now trading at a 10% discount to its 2 year average PE of 26.5x – which is understandable given 1) the miss 2) how well owned it is 3) the trend that most stocks simply get sin binned for a few months after a miss to earnings and a muted outlook. The concern of more downgrades will linger. Without going into too much detail on the miss, the earnings were better due to strong margins however top line sales were weaker and that’s what the market is concerned about. Slower growth in a growth business = PE re-rate which we’ve clearly seen in the last 2 days. 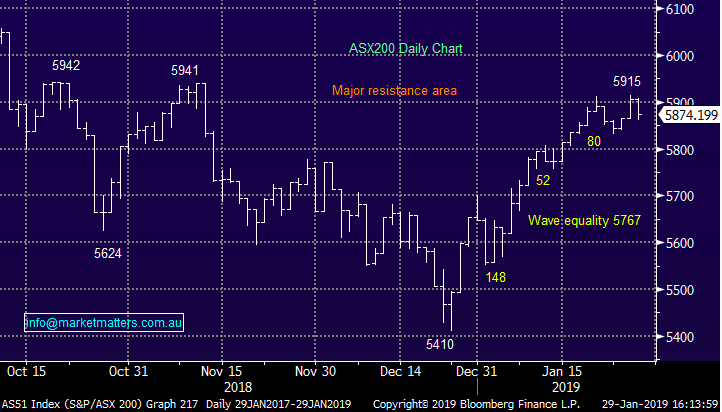 Morgan’s research on RMD is typically bullish and they have retained the rage on the stock, only downgrading earnings by ~3.5% however Macquarie and JP Morgan have turned bearish after the update and that combined call seems to have driven a big decline in the stock today. Macquarie though only downgraded EPS down by ~5% and cut PT to $13.70 while JP was more cautious particularly around 2H earnings. 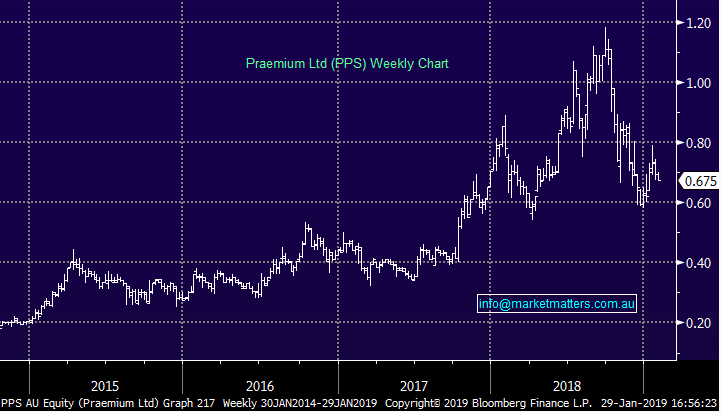 Ultimately, while it was a weak result in a stock that is well owned, the sell-off is excessive in our view, and the weakness today has prompted us to buy the stock, with an initial 3% weighting with room to move to 5% in time. 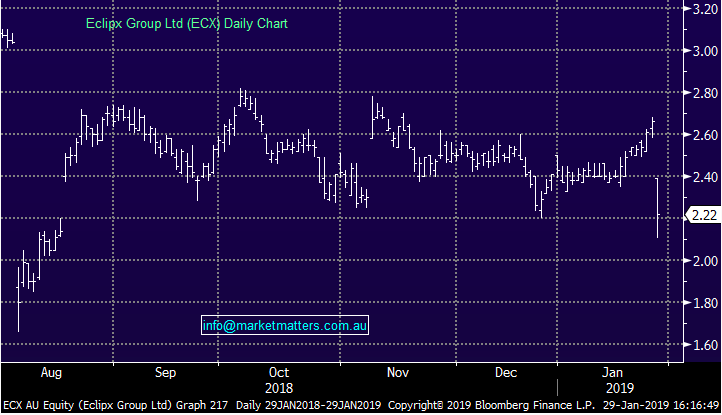 Credit Corp (ASX: CCP) $22.78 / +5.78%; Debt collector Credit Corp performed well today following the release of their first half numbers this morning. The company printed a profit number of $33.6m, which was in line with expectations, but surprised the market with an upgrade to full year guidance. They revised full year guidance to $69-70m NPAT, around the same level as consensus, but higher than the previously guided $67-69m. 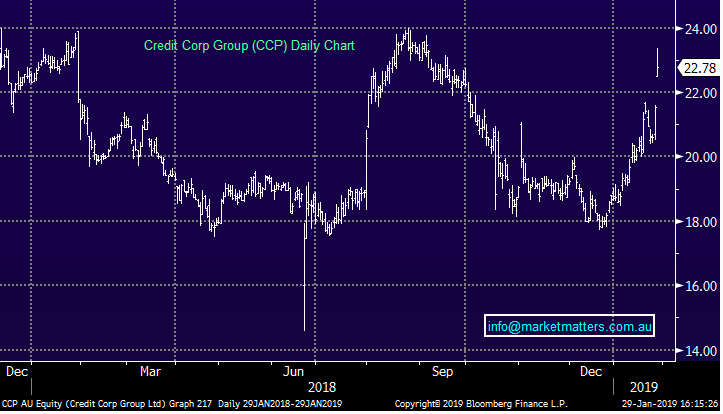 Credit Corp noted much of the growth has been driven by US debt buying which has seen substantial growth since FY15 and is expected to add ~$5m to NPAT in FY19, exceeding expectations. Locally, the ANZ “debt buying segment sustained near-record collections.” We don’t see a catalyst that will see CCP trade outside its ~$16-$24 trading range at this stage. 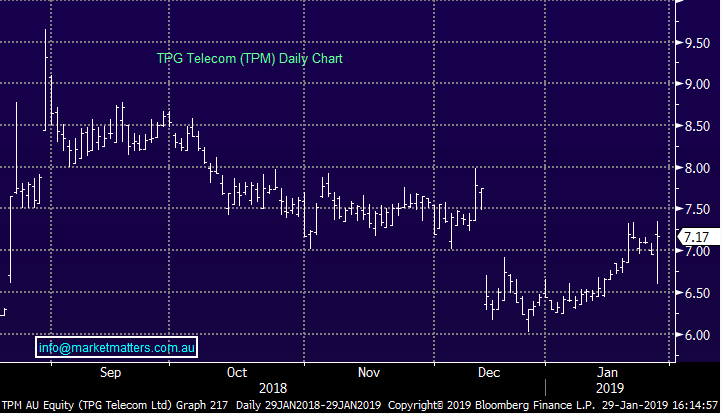 TPG Telecom Limited (ASX: TPM) $7.17 / +3.02% & Telstra (ASX: TLS) $3.19 / +7.77%; TPG surprised the market this morning announcing they would cease the roll out of their planned Australian mobile network which has caused the telco sector to jump today. The announcement from TPG comes following the Australian Government’s ban on using equipment from Chinese company Huawei on security grounds. 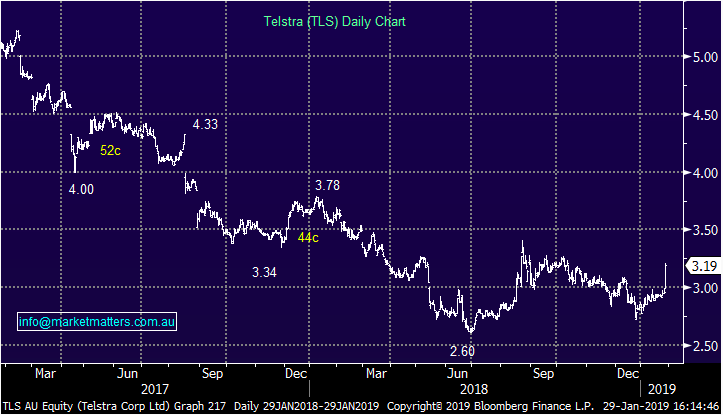 TPG had spent $100m of a planned $600m on Huawei products before halting construction of the network when the ban was originally announced back in August 2018, as well as around $1.5b on investment in spectrum since 2017. Vodafone Australia & TPG still remain in merger talks, with the proposal currently being reviewed by the ACCC. The competition watchdog did raise some reservations for the merger last year however we doubt they will ultimately have a problem with the deal. Vodafone-Hutchinson (ASX: HTA), which has a 50% stake in Vodafone Australia, was set to be the biggest beneficiary of TPG’s new network as it would vastly improve their coverage.